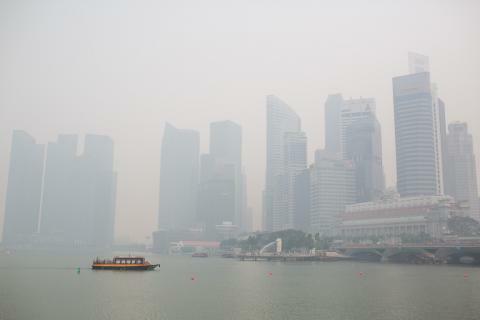 In August 2014, the government of Singapore passed a new law in an attempt to combat the problem of industrial smoke and haze spreading over a span of borders. The Transboundary Haze Pollution Act sets a legally actionable threshold relative to the Pollutant Standards Index (PSI). Singapore’s media outlets have reported on the widespread appearance of haze that has often seemed to emanate from the Indonesian island of Sumatra, the location of a number of palm oil, wood pulp, fiber, and paper manufacturing companies that farm the land through concessions. The new law sets government fines to be levied against companies that pollute at $100,000 daily, capped at $2 million. The cap, which was previously set at $300,000, was raised after public debate on the issue. To be held in violation, a company needs to show that it contributed to a PSI of 101 or greater over a 24-hour period. And individual citizens and other companies may also file suit against polluters, with no limit yet established for damages. As the first legislation passed in Singapore to attempt to cope with a longstanding problem, the measure attempts to move manufacturers toward greater accountability for adhering to sustainable and environmentally sound practices. However, the law may prove extremely difficult to enforce, since it aims to penalize actions committed within the borders of another sovereign nation. Asia Pacific Resources International Limited (APRIL) and its subsidiary Riau Andalan Pulp & Paper (RAPP), part of the RGE Group of companies under the direction of founder and CEO Sukanto Tanoto, take their responsibility to foster sustainable development seriously. The pulp and paper companies operate a large concession in Sumatra’s Riau Province, and APRIL is among the world’s leading producers in that market segment. As an entrepreneur, it is important to be responsible and accountable to the stakeholders of your business – in particular, playing your role as environmental and social steward. It is only through these continuous effort that a business is able to maintain competitiveness and be sustainable in the changing needs of the world. Due to Mr. Tanoto’s strong focus on sustainability and responsiveness to local communities, APRIL is committed to efforts to provide increased operational transparency. The company, which has held to a “zero-burn” policy since 1994, has consistently sought innovative ways of leading in sustainable forestry practices. The company has directed $1.5 million to a program of fire management, infrastructure, and training, and it maintains a rapid-response team of more than 600 personnel. In addition, it offers a “fire tracker” feature as part of its APRIL Dialog website, which is designed to provide up-to-date communications with the public regarding any detected fires. As a company whose profits rely on a steady supply of wood and forest products, APRIL has no financial interest in setting fires on its own lands. Its historical evidence shows that fires that have encroached on its property have originated either outside its concession borders or among the residents of its set-aside community lands, who often find burning to be an inexpensive means of clearing smallholder lands. APRIL, or Asia Pacific Resources International Limited, is among the natural resources manufacturing, wood pulp, and fiber-producing companies that comprise the RGE Group headed by Indonesian businessman Sukanto Tanoto. Under Mr. Tanoto’s direction, APRIL has increasingly focused on environmentally responsible, sustainable forestry and land-use practices. In working to comply with all relevant government regulations, and with international industry best practices, APRIL strives to exhibit transparency through its day-to-day operations and as part of its long-term strategy. Among the company’s recent efforts in this regard is the development of a website, APRIL Dialog. Through APRIL Dialog, the site aims to offer information about best forestry practices in general, and APRIL’s work in particular, to all interested stakeholders. The website also provides a means for communication with the public, who are invited to share their questions and concerns online. In addition, the site provides up-to-date information about haze and hazard conditions through a “fire tracker.” The highly useful feature offers maps showing the coordinates of current fires, as well as their causes and real-time firefighting operations. On the site, APRIL staff have provided information on topics such as sustainable development in Indonesia, the true causes of deforestation in developing areas, and recent events in the field of forest management in the country. Taking a proactive approach, the APRIL Dialog website also offers a section addressing accusations leveled against the company by environmental groups and others concerned about over-development in Indonesia. APRIL believes that its emphasis on sustainable practices is borne out by the available evidence, even as it works to answer substantive concerns by stepping up its policies and procedures. APRIL welcomes assessments of its compliance levels and other practices. The website also offers information about the current actions of the Stakeholder Advisory Committee, which APRIL developed and welcomed on board as a means of providing an even more transparent look at its operations. Always looking out for new ideas, new industry and new market to enter into, Sukanto Tanoto has done an intensive research on natural gas and their potential as a clean alternate energy in the future. This project is also strongly supported by his eldest daughter, Imelda Tanoto, who is heavily involved in the whole process from planning to execution. Read here for more information. Natural gas is increasingly in demand, throughout the developed world and in emerging economies, as an affordable and “clean” source of energy. With production up by more than one-third in the United States compared to a decade ago, natural gas offers attractive options for energy companies and consumers alike. When burned as fuel, natural gas produces only about half the carbon dioxide emitted by coal-powered plants, which makes it popular with many environmentalists. Moreover, according to the United States Environmental Protection Agency, natural gas emits less than one-third the amount of nitrous oxides and about 1 percent the amount of sulfur dioxides as coal. The burning of natural gas also requires a minimal amount of water and does not create any significant concerns regarding disposal of solid waste. Woodfibre LNG, an arm of the RGE Group’s Pacific Oil & Gas company, is currently working to open an operations plant to liquefy natural gas and export it from western Canada. RGE, directed by founder and CEO Sukanto Tanoto of Indonesia, hopes to make Woodfibre a leading player in the growing international market for natural gas products. In 2014, Woodfibre executives, led by Imelda Tanoto, Mr. Tanoto’s daughter, signed a letter of intent with the government of British Columbia (Premier Christy Clark) to explore options that would benefit both parties as well as the people of the province. In addition, the 13 million vehicles worldwide currently powered by natural gas produce approximately 30 percent fewer greenhouse gas emissions than those that run on traditional gas and diesel sources. Depending on conditions in local markets, natural gas can be significantly cheaper than other fuel sources, which makes it a good choice for developing economies. Woodfibre’s proposed Canadian export station would re-purpose a now-unused Vancouver-area pulp mill, located on land with an existing industrial pipeline infrastructure and electrical grid, all of which stand to minimize the impact that constructing an entirely new facility could produce. APRIL, one of the world’s largest pulp, paper, and fiber manufacturing companies, operates as part of the RGE Group, which is based in Indonesia and directed by entrepreneur and philanthropist Sukanto Tanoto. Sustainability is a crucial determining factor to the success of a company. In order to have a lasting business model, one needs to think of how to best develop sustainable practices. Through working closely with a variety of interested parties, including a Stakeholder Advisory Committee composed of a team of independent experts, APRIL adheres to the highest possible standards of environmental stewardship as it monitors the fire-prevention, sustainability, and social issues associated with its operations. The company maintains more than 200,000 hectares of protected conservation forestland on Sumatra near its wood and pulp processing mill. Its Wood Purchase Policy assists in guarding against illegal logging operations through a tracking system and a chain of international certifications. APRIL, and the wood pulp and paper industry in general, have increased their focus on sustainable practices over the last few years. Aware of the impact of any business that makes extensive use of natural resources, corporations like APRIL have begun to rely more and more on transparency and dialogue with local community groups in the regions in which they do business. With the developing world’s increasing demand for products such as timber and wood pulp, the issue of sustainability has evolved into one that affects the entire world. China, which has a burgeoning export trade in wood and paper products, is comparable to many other rapidly developing nations in its recent focus on implementing comprehensive reforestation programs in order to keep pace with usage. Thanks to increasing government involvement and interest in promoting the industry, Indonesia has become a key player in the international wood pulp products market. The country had already reached a spot among the top 10 nations in the field a decade ago. With APRIL and similar companies taking more comprehensive looks at long-term strategies that make good sense both economically and environmentally, sustainability may now be a more achievable goal. Sukanto Tanoto, who directs the work of multiple companies under the $15 billion corporate umbrella of the RGE Group, is an Indonesian-born entrepreneur who worked his way to success through his determined efforts and dedication to constant education and self-improvement. Mr. Tanoto continues to emphasize these values throughout his businesses and the philanthropic work of the Tanoto Foundation, which aims to provide educational assistance and to empower workers, students, and others in Indonesia, Singapore, China, and beyond Southeast Asia. In addition, he maintains a strong focus on the long-term sustainability of his companies and the communities in which they do business. Sukanto Tanoto believes that environmental sustainability and a focus on the needs of all stakeholders are essential to long-term profitability and good corporate citizenship. His company Asian Agri, which is based in Indonesia, maintains facilities in three locations on Sumatra, partnering with local smallholder farmers to manage some 60,000 hectares of palm oil plantation land. One of the country’s largest such operations, Asian Agri, works to harvest its palm oil product in a manner that supports the conservation of the environment and empowers local farmers, as well as other considerations of the greater social welfare. Under Sukanto Tanoto’s leadership, Asian Agri has delivered numerous economic, social, and educational benefits to its nearly 30,000 partner smallholder families. In addition, Mr. Tanoto has worked directly with Amanah, a smallholder palm farmer group, assisting members in earning certification in sustainability practices. In 2013, due to his support, Amanah became the first organization of Indonesian smallholders to receive such certification. Recently, in an effort to encourage sustainable palm production among farmers, Asian Agri shared premiums or extra proceeds from exports totaling $220,000 with the representatives of Village Unit Cooperatives (KUD) in the Jambi and Riau provinces. The products produced through these farming methods have been well-received in the international markets. Freddy Wijaya, general manager of Asian Agri, said that farmers have been encouraged to plant sustainable palm not only for the opportunity to obtain premiums, but also to achieve long-term sustainability. European countries tend to favor sustainable palm oil because the production process does not cause environmental damage. Farmers have found more market certainty in Europe, where they have a wider margin and can cover greater production costs. International authorities, writing in peer-reviewed journals, have described this type of sustainability entrepreneurship as providing responsible stewardship of resources, as well as long-term opportunities for worker advancement, in addition to the traditional entrepreneurial emphasis on profits. A concentration on sustainability also tends to drive companies in the positive direction of increased innovation in products, processes, and services. As an entrepreneur, Sukanto Tanoto is always looking for ways to expand the business. One of the bold movements he took was to list Sateri on Hong Kong Stock Exchange. After calculating the risk, he went ahead to enter the market and without losing his focus along the way, Sateri is now a well recognised company, receiving awards for its success. In 2014, Sukanto Tanoto’s RGE Group company Sateri Holdings Limited, a major international producer of cellulose products with manufacturing and production facilities in Brazil and China, received its third Asian Excellence Recognition Award in a row. The award, presented by the continent-spanning publication Corporate Governance Asia as part of its effort to encourage superior business practices throughout the region, highlighted Sateri’s record of success in corporate governance and investor relationships. Under the direction of RGE Group CEO and founder Sukanto Tanoto, Sateri works to maintain high-quality and environmentally sustainable business practices in every aspect of the company’s operations. Headquartered in Shanghai and Hong Kong, Sateri produces a variety of grades of highly pure, dissolving wood-pulp products, as well as viscose staple fiber, for an increasingly demanding market. 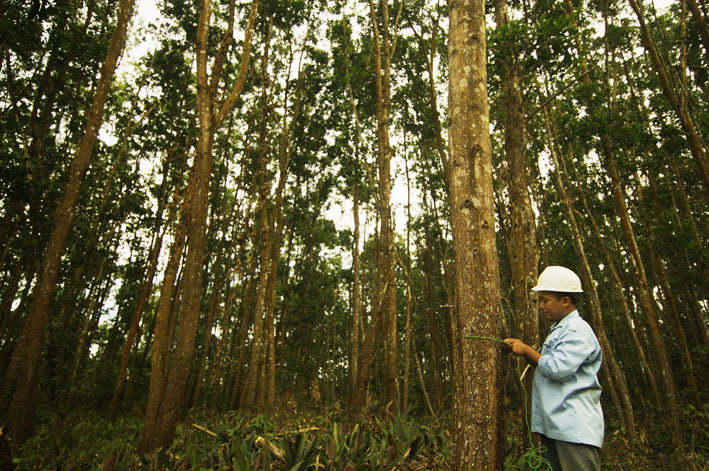 The company’s Brazil-based upstream operation, located on 150,000 hectares of land farmed by freeholders, consists of a plantation sustaining renewable eucalyptus growth, as well as a wood-pulp mill. In China, Sateri’s downstream production facility processes dissolving wood pulp into viscose staple fiber. Sateri wood pulp and viscose products are frequently used in nail polish, lip gloss, shaving cream, high-performing automobile tires, baby wipes and other personal care and sanitary products, and a variety of textiles. Sateri viscose adds body to cosmetics, color and quality to fabrics, and stability to heavy-use products. In addition, Sateri products create thicker ice cream without adding unwanted extra calories, and thicken paints while keeping them easy to brush on surfaces. Being a socially responsible entrepreneur, Sateri and Sukanto Tanoto demonstrate their ongoing commitment to the environment by adhering to all relevant local and regional official regulations and striving for the highest possible quality in corporate social responsibility. For example, Sateri’s Brazil-based mill incorporates cutting-edge design standards and includes a chemical recovery operation that recycles as much as 95 percent of all chemicals utilized in the manufacturing process. The company’s Chinese and Brazilian facilities have received ISO 14001 certification for environmental management.